HeatTech mat’s fiber mesh with adhesive backing adds stability to the flooring, simplifies the layout process and reduces installation time. A single cold lead makes wiring quicker and easier. 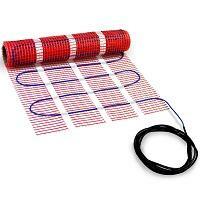 Heating wire is spaced at 3” apart and is capable of producing as much as 12W of heat per square foot of flooring.